The NFL preseason is just over two months away. The NFL’s actions in this past season dictates that all freedom-loving Americans will boycott this globalist serving organization. This article demonstrates how the NFL is an extension of the TSA, DHS and the globalist agenda in general. The new NFL policies are something right out of the Pol Pot regime. In some stadiums, women cannot enter the same entrance as men and children. This is FEMA camp training. The American public is being conditioned to the fact that the state owns your bodies and your freedoms. In addition, the NFL is promoting various globalist agendas such as gun control, and they are doing so with our money. The NFL has come to represent a new era of in-your-face-tyranny. Soon, the following picture will be played out in American stadiums all across our country. At Giants Stadium, on March 24, 2011, DHS and local law enforcement conducted a “relocation” drill in which civilians were transported to the stadium. The NFL has decided it is not enough for Americans to be abused by the TSA at the airport, the NFL has become the newest version of the TSA. A blind man could see that the NFL is good FEMA camp training. On September 23, 2011, children, without warning, were abducted from their Denver schools by FEMA and taken to the Colorado Sports Authority football stadium. At my son’s middle school, we cannot even have my son’s aunt pick him unless she is registered with the school and shows identification. Yet, FEMA can literally abduct children from their schools without parental permission or notification? This is outrageous! In the commission of a crime, if you drive the getaway car and get caught, are you going to jail? You are darnn right you are going to jail! Should we not expect the same of a sports league in which select owners thinks it is OK to aid and abet in the act of kidnapping a child from his or her elementary school. In Operation Mountain Guardian, we should remember, that this is the same NFL that allowed FEMA to bring school children to the Denver Broncos Sports Authority Field after they were illegally removed from their elementary schools without parental notification or permission. To date, there has been no apology or explanation given. The same thing took place at the New York Giants Stadium as well. Why would anyone support such an organization? FEMA/DHS tipped their hand at Operation Mountain Guardian when they snatched the kids from their Denver elementary schools. I think it is highly likely that children will be taken while at school in order to lure their parents in to the public detention facilities. This also tells you that the coming false flag attacks will take place between noon to 2 pm (Eastern), 9 am to 11 am (Pacific) in order to have all of America’s public school students in school in order for DHS/FEMA to control them. The sigh at Arrowhead Stadium demonstrates clear intent that the NFL is working DHS in order to become martial law ready.This also signals that the NFL stadiums are going to be staging areas for martial law. Perceived trouble makers will be lured to their final destination of justice as they try and retrieve their children. 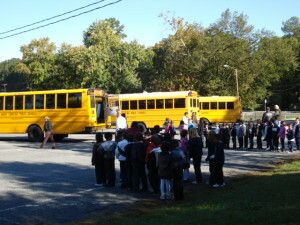 Here are children being separated from the authority of their parents as well as the supervision of school officials. FEMA had no right to abduct these children. Again, it is all part of the conditioning process. According to the globalists, your children do not belong to you. Your body does not belong to you. Everything belongs to the state. When the “Disaster” buses roll up to your child’s school, your family better have a contingency plan if you ever want to see your children again. Any historian, worth his or her salt, knows the gun confiscation always precedes a mass genocide by a government. This sequence of events happened 17 times in the 20th century resulting in over 260 million deaths according to the University of Hawaii. So, why is the NFL promoting gun confiscation? Who will ever forget as sportscaster and pseudo-intellectual, Bob Costas, used a national football television audience to promote the anti-Second Amendment views of the NFL in reference to a gun control rant Costas made after former Kansas City Chiefs player, Jovan Belcher, was involved in a murder-suicide tragedy. Costas, during halftime of the Kansas City-Denver Broncos game, quoted Fox Sports columnist Jason Whitlock and said, “If Jovan Belcher didn’t possess a gun, he and Kasandra Perkins would both be alive today”. It was disgraceful for Costas to use a tragedy on national TV to advance the NFL’s anti-gun agenda. 5. Firearms, ammunition or other weapons; however, stores that sell firearms and ammunition (e.g., outdoor stores and camping stores) will be permitted, provided they sell other products and the ads do not mention firearms, ammunition or other weapon. Subsequently, we have seen the NFL support the erosion of the Constitution, namely, the First , Second and Fourth Amendments to the Constitution and this is being done at a time when Obama is arming the al-Qaeda backed Syrian rebels. And let’s not forget that this same President was arming the Mexican drug cartels by shipping guns into Mexico under Fast and Furious. What Is the Motivation Behind the NFL’s Actions? Nobody is asking why the NFL would so willingly go along with this tyranny that is beginning to alienate the fan base of America’s most popular sport. The answer to this question is the same answer to the question as to why today’s pastors have compromised their message delivered from the pulpit. Did you know that the NFL made $9 billion dollars last year? 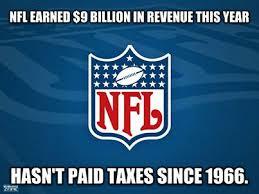 Did you know that the NFL is a tax-exempt corporation and paid no tax on their $9 billion dollars of profit in the 2012-2013 season? What is wrong with this picture? Churches no longer take on issues like abortion and the war in Afghanistan from their pulpits on high. Pastor’s have willingly adopted the perverted interpretation of Romans 13 to get their flock to blindly follow the orders of a tyrannical government. Why would the pastors do this? The root of all evil is indeed money. As most churches declare themselves tax exempt under the provisions of 501 c 3, the IRS forbids the pastors to make political statements, or to allow a tax-exempt church to engage in political activity as a body. So, you might ask, what does this have to do with the globalization of the NFL? The NFL is granted the privilege of violate the anti-trust legislation this country. Both your pastors and the NFL have sold out their integrity for 30 pieces of silver. There are a number of ways that people could react to this information. I do not believe that denial would be one of the expected responses as there is just too much proof that the NFL is no longer just in the entertainment business. The NFL is firmly in the grip of the globalists and subservient to their agenda. Mainstream America is enthralled with this entity that made over $9 billion dollars last year. However, the NFL does not represent the values of the American middle class once the game action leaves the field. If Americans wanted to strike a blow at the globalists, boycotting the NFL would prove to be an ideal course of action. What message would that send to the globalists if the NFL were to go down in flames for supporting the New World Order agenda? Simply put, do not buy NFL clothing and write to their corporate partners telling them that you are boycotting their products, as well, because they are affiliated with the NFL. The initials, NFL, should come to stand for Not For Long. We have the ability to win this one battle. We can destroy this globalist entity by simply withdrawing our support. And if that strategy were to work in collapsing this entity, imagine how empowered the people would become in taking on other globalist-controlled programs. Letter to recruit mock parents to participate in Operation Mountain Guardian. The Colorado North Central Region, Denver MMRS, Denver UASI, Denver Police Department and Denver Public Schools are looking for 30 parent volunteers to participate in the upcoming Operation Mountain Guardian (OMG) exercise on Friday, September 23, 2011. OMG is a fullscale, multi-jurisdictional exercise that will take place at several locations in the Denver metro area. The exercise will focus on the emergency response to multiple terrorism-based incidents and will include more than 80 law enforcement, fire, EMS, hospital, and emergency management agencies. *DPS is in need of parent volunteers to report to Rita Bass Center at Denver Health, 190 West 6th Avenue (SE Corner of 6th Avenue and Bannock Street) at 8:00 a.m. on Sept. 23, 2011. *Parents will be asked to test the medical information release and reunification processes in place across the city. The exercise should finish at Denver Health at approximately 11:30 a.m.
*Parents are also need to test the same systems at Sports Authority Field. Parents will need to report to the north entrance of the stadium at 12:00p.m. The exercise will finish at approximately 3:00 p.m. Parking at both locations will be provided. Please note this is an exercise designed to test the metro areas response to a catastrophic incident. DPS will be evaluating our Emergency Preparedness procedures in our schools, Response, Evacuations, Reunification, and the procedures for response by DPS departments: Safety and Security, Communications, Transportation, Facilities, Enterprise Management, Risk Management and others as necessary. If you are able to volunteer please contact Melissa Craven, Melissa_craven@dpsk12.orgor 720-424-2634. In your message please provide your name and contact information as well as which location you wish to volunteer. Site specific details will be sent prior to the exercise. Dave Hodges is an award winning psychology, statistics and research professor, a college basketball coach, a mental health counselor, a political activist and writer who has published dozens of editorials and articles in several publications such as Activist Post, News With Views and The Arizona Republic. His Radio program on Republic Broadcasting, The Common Sense Show, features a wide variety of important topics that range from the loss of constitutional liberties, to the subsequent implementation of a police state under world governance, to exploring the limits of human potential. The primary purpose of The Common Sense Show is to provide Americans with the tools necessary to reclaim both our individual and national sovereignty. Check out Dave Hodges website and writings here.